Article first published as TV Review: STRANGER THINGS 2 on Seat42F. Caution: This review contains light spoilers from the first three episodes of season two. Netflix’s 1980s-set sci-fi horror Spielberg-esque hit, STRANGER THINGS, is back for a second round! Similar to a movie series, it’s being titled STRANGER THINGS 2, which seems appropriate, given the feel of the program. Like before, it features a scant number of episodes (nine this time). But also like before, this makes for a concentrated, intense story about weird occurrences in a small town. All of your favorite players have returned, plus a few new faces, and the quality seems to have been maintained. The stakes have even risen a bit. The action picks up roughly one year after the events of the first season. Will Byers (Noah Schnapp) is still haunted by his time in the Upside Down. Mother Joyce (Winona Ryder) hopes these are just flashbacks, as Dr. Owens (Paul Reiser, Married) seems to indicate. Will’s brother, Jonathan (Charlie Heaton), is there to help his brother through. But Owens may have ulterior motives, working with the government agency that has kept a tight lid on the alternate dimension, forcing all who know of it not to tell anyone, and it soon becomes clear that Will is being warned of a new, bigger threat. Meanwhile, Will’s friends all have their own things going on. Lucas (Caleb McLaughlin) is interested in the new girl in town, video game master Max (Sadie Sink, American Odyssey). Dustin (Gaten Matarazzo) has an odd pet. Mike (Finn Wolfhard) has some serious emotional issues. Nancy (Natalia Dyer) isn’t sure she’s made the right choice in staying with Steve (Joe Keery). Even Joyce has a new steady, Bob (Sean Astin, The Goonies). These are all interesting stories, some more than others, but they do an important thing. As much as I liked season one, the story was concentrated on a few members of the large ensemble, with others regulated to supporting status. In STRANGER THINGS 2, the plot is more balanced, incorporating more of the cast on a regular basis. There are more moving pieces of note, which makes for a denser story. This isn’t a knock on season one, which made the right choice for the initial outing. However, it’s a satisfying development for the sequel, now that the world is more established. It’s also nice that Barb figures into STRANGER THINGS 2. Yes, she’s still dead, and I don’t think it likely that she undergoes resurrection. She was the also-missing in season one, someone who caught audience attention, but didn’t have much traction on screen. A subplot involving her parents, who have still not been told of her death, is moving and heart-breaking, giving more meaning to everyone’s favorite redhead downer. Many fans tuning in are probably most curious about Eleven (Millie Bobby Brown), who we last assumed was hiding out in the woods. She is, courtesy of Jim Hopper (David Harbour), protected and hidden from friends and foes alike. While I don’t mind this in of itself, it is made better by the flashbacks to show what happened and how it happened between Eleven and Hopper in between seasons. This better informs the relationship between the cop and his sort-of-adopted-daughter, as well as the motivations both are facing now. 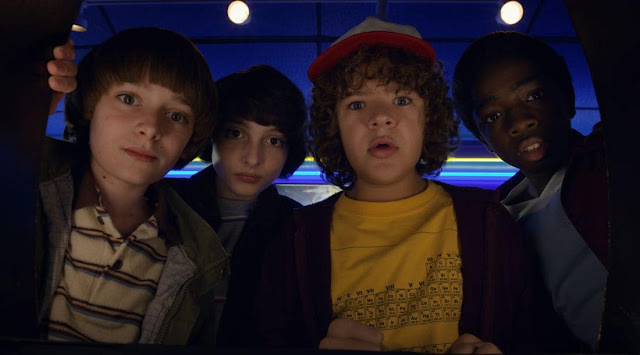 I think STRANGER THINGS 2 totally lives up to year one. It’s enticing, well-made, beautifully produced, and has fine performances, including the newcomers, who easily slide right in. It deepens a complex mystery, and both scares and touches you at the same time. The wonder and charm have been retained, even while what is terrifying has gotten more so. As important, it remains grounded. There are plenty of places for this show to go, and I’m happy to be along for the ride. STRANGER THINGS 2 is available now on Netflix.